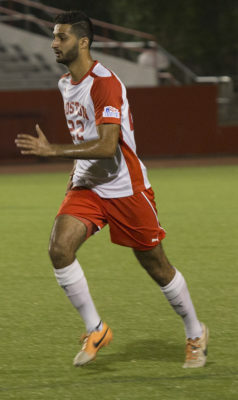 Coming off a 1-0 shutout win over the United States Naval Academy on Senior Day — where 10 Terrier seniors were celebrated — the Boston University men’s soccer team will travel to West Point, New York to take on the United States Military Academy. The Terriers (6-7-2, 5-1 Patriot League) have been impressive in Patriot League play this year and are tied atop the conference standings with Loyola University Maryland. Underclassmen have been the major storyline of the team this season, with sophomore forward Matt McDonnell leading the team with four goals and freshman midfielder Toti Knutsson just behind him with three. Roberts has high praise for his underclassmen, who have been thrust into the spotlight. The Black Knights (8-5-1, 2-3-1 Patriot League) boast the Patriot League’s best defense, conceding only nine goals and allowing only 110 shots. Instrumental to their defensive success is their man between the posts. Army’s sophomore goalkeeper Justin Stoll holds the league’s best goals against average at .622, along with a goal save percentage in the top five at .769. The Black Knights pose a clear threat to Roberts’ team and this remains something he acknowledges. BU’s sophomore goalkeeper Michael Bernardi will have to be alert against Army — who have registered over 200 shots this season. Bernardi boasts a 1.15 goals against average this season over his nine appearances and a .737 goal save percentage. Roberts will be relying on his keeper to stifle the Black Knights’ offense that fires at will. BU is 4-1-1 in their last six games and lead the all-time series with Army 6-2-1. BU has had to deal with their fair share of injuries this year, but heading towards Patriot League Tournament play, one thing Roberts has preached and will continue to preach is consistency, especially for a unit that has had to deal with injuries from before the start of the season.